Dispatched, from the UK, within 48 hours of ordering. This book is in good condition but will show signs of previous ownership. Please expect some creasing to the spine and/or minor damage to the cover. Notes. Pen or pencil notes in some parts of book, however this does not interfere with your use or reading. Aged book. Tanned pages and age spots, however, this will not interfere with reading. Very Good. 2004. Later Printing. Paperback. Good clean copy with some minor shelf wear.....We ship daily from our Bookshop. Very Good. Searching for God Knows What: Bearded Women, Alien Philosophers, Lovesick Teens, and the Gospel of Jesus by Miller, Professor Donald, 2004-10-11. Trade paperback (US). Glued binding. Very Good. Searching for God Knows Whatweaves together beautiful stories and fresh perspectives on the Bible to show one man's journey to find it. Trade paperback (US). Glued binding. 272 p.
Once again Donald Miller has pushed away the traditional barriers and lured us into his world and explained in plain English how it can feel to be real. A great read, as was Blue Like Jazz. Thanks, Donald. 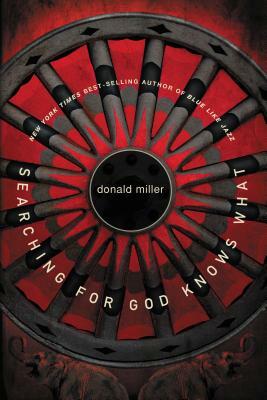 More mature than his his first books leading up to it, "Searching for God Knows What" steps a way from Miller just talking about himself and what he is going through to a more study like style discussing Jesus, and why we need him. This books is best read after "Blue like Jazz" so you can achieve a view of where Miller came from.